By Fahad Khan in Mobile. Updated on February 28, 2016 . The best thing about owning a mobile device is the mobility it provides; the worst thing is that being mobile raises the chances of you losing your devices in unimaginable ways. In circumstances where you actually lose a device, there are many third-party apps that can be used to track lost or stolen devices, but there are also dedicated tools for iOS and Android users. For iOS devices, owners can track their iPhone, iPad or Mac with the Find my iPhone app. 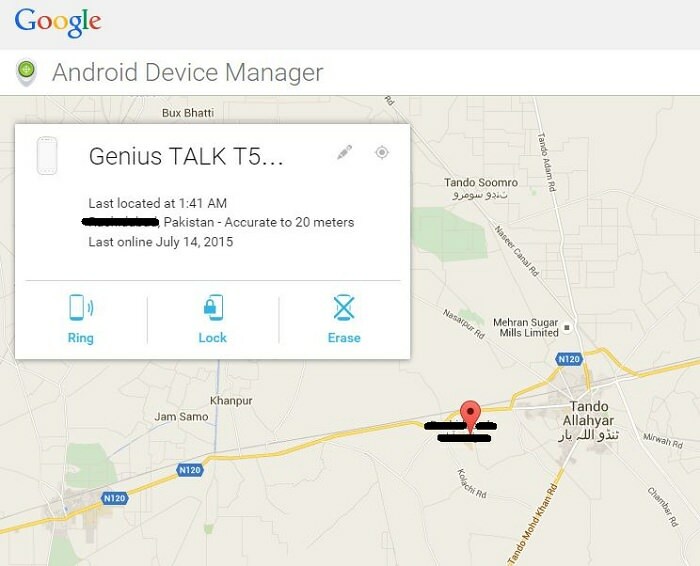 For Android users, the lesser-known equivalent is the Android Device Manager. 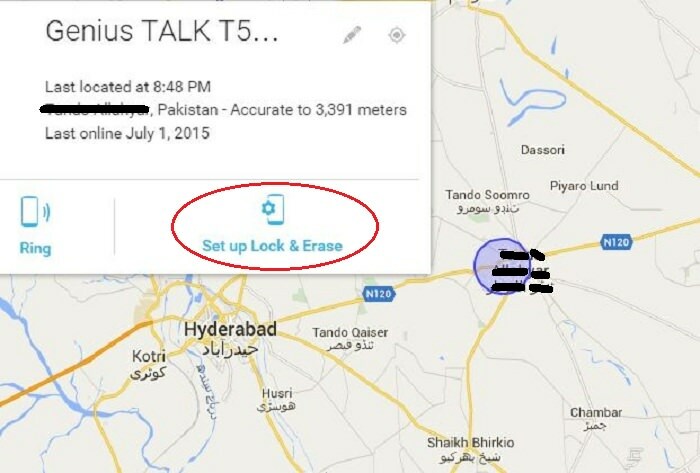 Android Device Manager or ADM has been available in the Play Store since December 2013. In newer Android devices, ADM is pre-installed into your device. Note: ADM requires Android 2.3 and above to function. First, we need to setup ADM. To verify that ADM is installed on your device and enabled to work properly, go to the Google Settings on your Android Device. 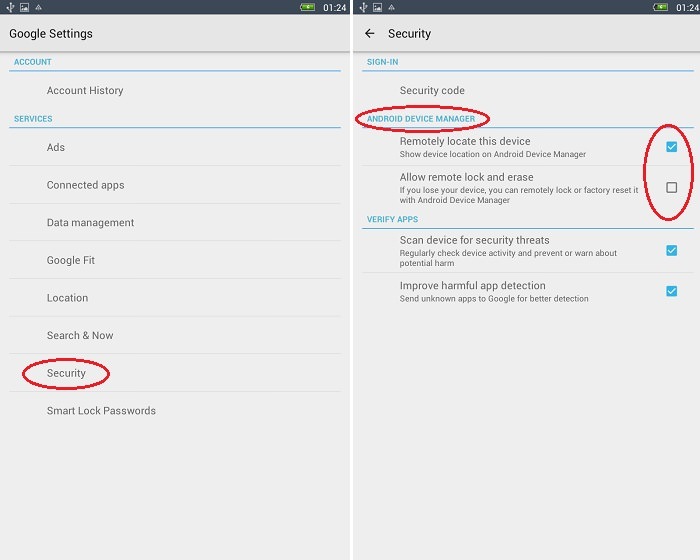 Tap on Security under the Services option and here you can see Android Device Manager (ADM) if it is installed on your Android device. 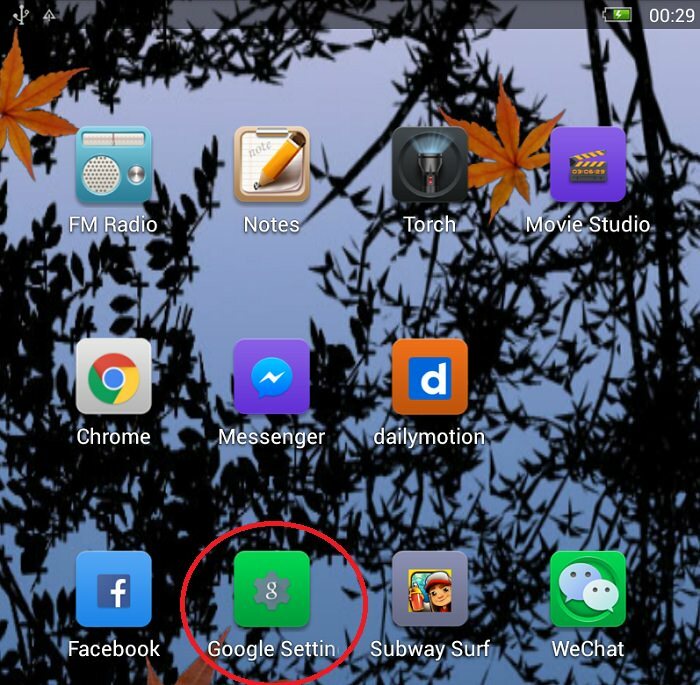 If you cannot see ADM, it means it is not installed on your Android device and you can install it from here. Once you are done with setting up ADM successfully, it is time to explore features and functions of ADM one by one. By default, Remotely locate this device is enabled and Allow remote lock screen is disabled. On any computer browser, go here (ADM web version) to start. Sign in with the same Google account you used on your lost Android device. If your Location is on, the location of your Android device is displayed on Google Maps, accurate to 20-25 meters of the precise location. 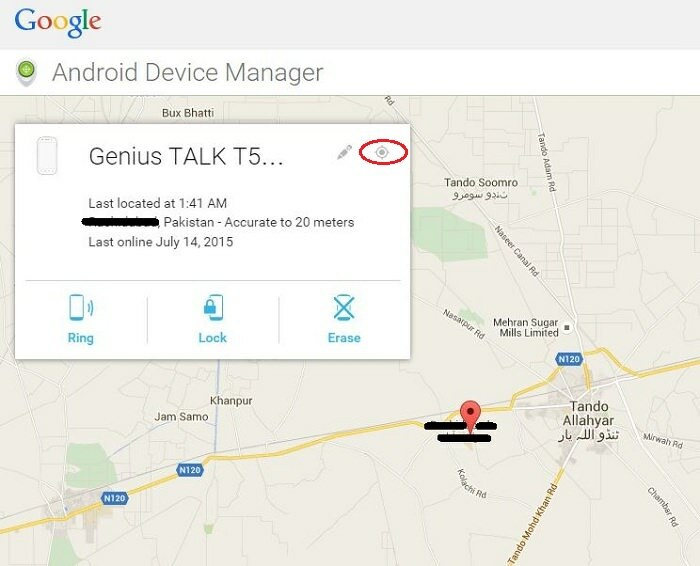 If you do not have any laptop/desktop computer around and you want to access Android Device Manager on another phone, you can download the app here instead of using it on a mobile browser. On the mobile app, sign in via Guest Mode and enter your Google Account details to track the location of the lost device. You can check the current location of your Android device without refreshing the page or signing in again. Click on the location icon button on the right to see the location of your device. 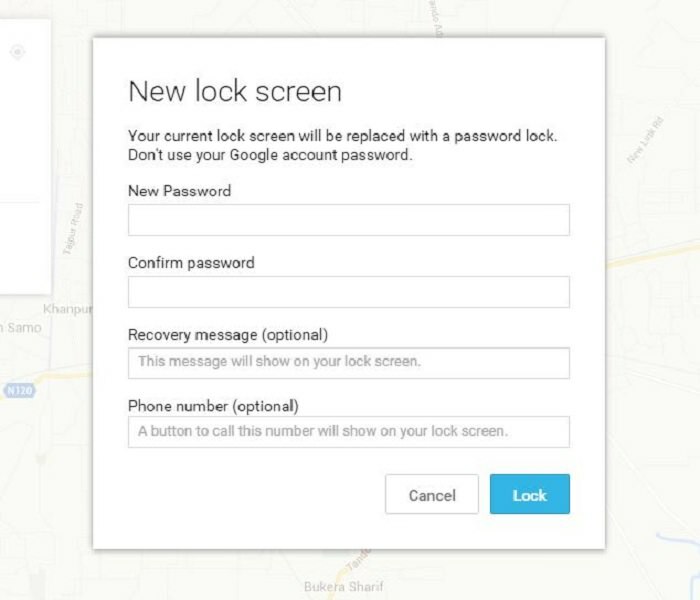 If in the event of losing your phone, you had not set a lock screen as an added security step, it’s not too late. With ADM you can not only bypass the lock screen and lock it with another password, but also add a custom message or alternate phone number on the lock screen. To bypass the lock screen, choose the Set up Lock & Erase option. On some phones, the options are already split to a separate Lock option and an Erase option. Click on Lock and enter your new password, repeat the password to confirm. This can help minimize someone else intruding into your contact list, emails, photo gallery, messaging apps and other important information. You can add an optional recovery message as well. This is a message that is directed to anyone who may have stumbled upon your phone so be constructive with the message in the hopes that your device will be returned to you. You can also give an alternative contact number here. A button will appear on the lock screen. Tapping that button will authorize the phone to call you. This step is best done after you have lock your device and set your recovery message and alternative phone number on your lock screen. Provided that your Location was on, and your device is online, you can click on Ring to make your device start ringing. This option will confirm for you whether device did ring or did not. If you are at the location near your missing phone, this could alert to you or a passerby of your phone’s location. The device will ring for 5 minutes. If your phone carries sensitive information that are already backed up, and you don’t this info to fall into someone else’s hands (for instance business-sensitive information or banking info) you can use ADM to perform a factory reset. Just choose the Erase option, next to the Lock option. This effectively erases all your data and settings on your device. If the device is offline, the factory reset will be performed as soon as the device is online. 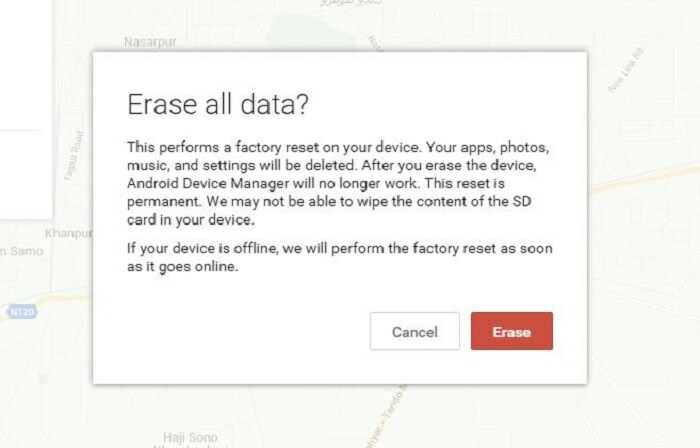 Note that once all data is erased successfully, ADM is no longer available for your Android device.